The moment I saw this jacket online I knew I had to make it mine. I decided to wait until it arrived in stores to try it on myself, and since I work in a mall (deadly, I know) I went quite frequently to see if it was there. Finally, after a few days I saw it and it was 40% off! YES. 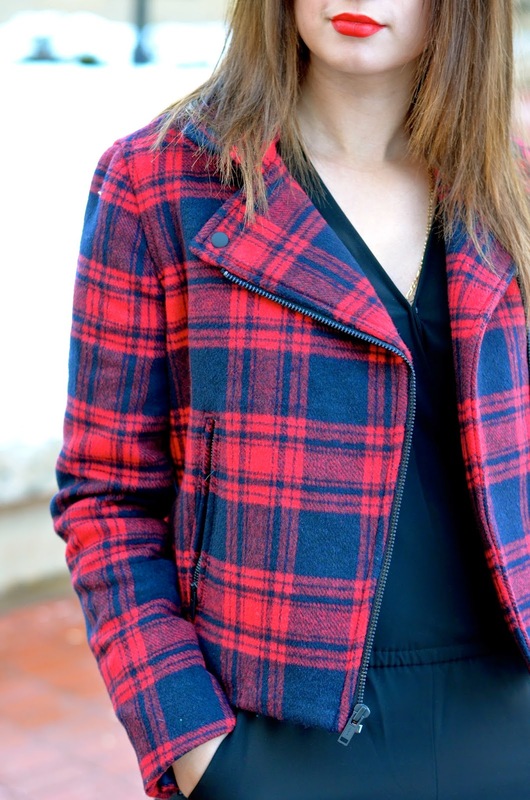 It's the perfect plaid jacket and I love how thick it is which helps in the very chilly temperatures we have been experiencing. Does anyone have any tips on how to pack for two extremely different climates? I'm already kinda freaking out about it! That jacket is far too cute! Do you want to be my sister-girlfriend so I can tag along to Barbados with you guys? ;) lol. Seriously, you are going to have the best Christmas! Also, I absolutely love your jacket! I love your plaid jacket! !